Until recently, cannabis and its derivatives were widely restricted under legislation which stated they had no medical value and carried a substantial risk of misuse. Policy is rapidly changing, and cannabis can now be prescribed for medicinal use in many countries, including the UK. This provides important new opportunities for treating patients although these need to be weighed up against potential risks. Several different medicinal products exist, with contrasting mechanisms of action, efficacy, and safety. Use of these products may increase as new evidence arises and policy changes occur. Here we review this emerging field. What are the latest developments in regulation, in the UK and internationally? In the UK, drugs perceived by policy makers to have no medical value and a high risk of misuse, such as MDMA (3,4-methylenedioxy-methamphetamine, common street name “ecstasy”) are placed in Schedule 1 of the Misuse of Drugs Regulations 2001. These drugs cannot be prescribed, and research can only be conducted under a Home Office licence. On 1 November 2018, unlicensed cannabis based products were moved from Schedule 1 to Schedule 2 in the UK, enabling them to be prescribed for the first time.1 This amendment of UK legislation affected some but not all products, as some were already listed in Schedule 2 or 4 (table 1). Non-medicinal synthetic cannabinoids (which are found in products such as “Spice”) were not rescheduled and remain in Schedule 1. Cannabidiol (CBD) has minimal risk of misuse5 and was never scheduled in the UK. What types of product are available and where? The cannabis plant can produce at least 144 naturally occurring compounds known as cannabinoids.7 The most widely researched cannabinoids are ∆9-tetrahydrocannabinol (THC) and CBD. THC is the primary constituent of cannabis that causes the “high” whereas CBD is not intoxicating at typical doses. Several different products exist for medicinal use and these differ in THC/CBD profile, formulation, licensed indications, and conditions for prescribing (table 1). See the glossary of terms (box 1) for accepted definitions. Cannabis based products that were previously listed in Schedule 1 can now be prescribed by doctors on the General Medical Council Specialist Register in the UK, on a named patient basis. Currently, general practitioners in the UK cannot prescribe them. These products are not licensed for specific medical indications but are used off licence for medicinal purposes in many countries, and are certified for quality according to good manufacturing practice. Examples include herbal cannabis (floral material from the cannabis plant). The recommended route of administration is through a medical vapouriser device9 and smoking is currently prohibited under NHS guidance.10 Extracts from the cannabis plant (such as cannabis oils containing THC) are also available for oral administration. Some cannabis based products were already available for medicinal use before rescheduling in 2018. Sativex, an oral spray derived from the cannabis plant containing THC and CBD in a 1:1 ratio, is licensed for the treatment of spasticity in multiple sclerosis in 29 countries, including the UK, Israel, Canada, Brazil, and Australia. However, meta-analysis suggests its effectiveness may be limited11 and it is not recommended by the UK’s National Institute for Health and Care Excellence (NICE) because of poor cost effectiveness.12 Epidiolex, an oral CBD solution derived from the cannabis plant, was licensed by the US Food and Drug Administration in June 2018 for the treatment of seizures in two rare and severe forms of childhood epilepsy—Lennox-Gastaut syndrome and Dravet syndrome. At the time of writing, an application for the same indication is under review by the European Medicines Agency, and it can currently be prescribed on a named patient basis in the UK. Dronabinol and nabilone are synthetically produced medicinal products that mimic the effects of THC. Dronabinol has an identical structure to THC, while nabilone has a related structure and is more potent than dronabinol, requiring lower doses to achieve clinical efficacy. Countries including the US, the Netherlands, Germany, Austria, and Croatia have licensed the use of both products. They are licensed for the treatment of weight loss in patients with AIDS and of nausea and vomiting in people receiving chemotherapy who have failed to respond adequately to conventional anti-emetics. Nabilone is licensed in the UK while dronabinol is not licensed but can be prescribed on a named patient basis. 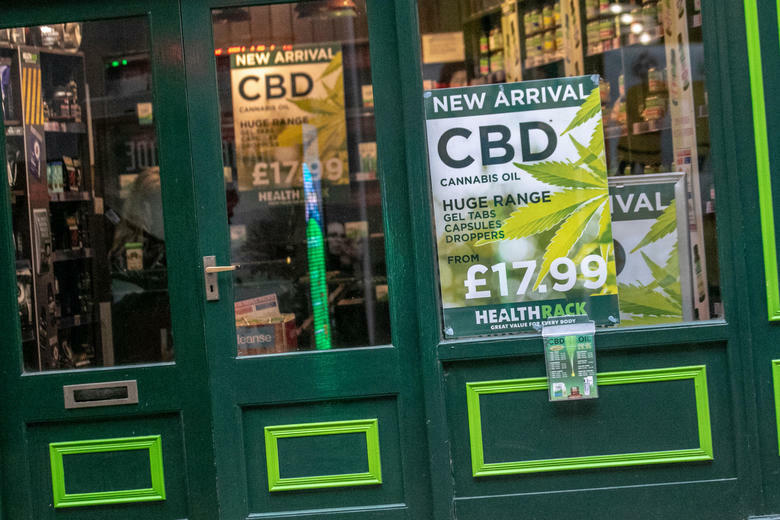 CBD products are also widely available in health food shops and on the internet in the UK and elsewhere (fig 1) and are not scheduled or regulated as medicines. Their THC or psychoactive content is legally controlled not to exceed 0.2% in the EU.8 As with other herbal remedies, the declared contents of non-medicinal CBD preparations is variable, and often inaccurate,213 and these products sometimes exceed the legal limit of THC.13 Moreover, the amount of CBD in these products is typically far lower1415 than in clinical trials16 (eg, 25 mg in a non-medicinal product versus 150-1500 mg/day in clinical trials). Advise patients that these widely available CBD products lack quality assurance and should not be treated as medicines. Other products include non-medicinal cannabis and non-medicinal synthetic cannabinoids, which are both currently illegal in the UK. Why and how are cannabis based products and cannabinoids therapeutic (or harmful)? What is the evidence underpinning medicinal use of cannabis based products and cannabinoids? Summary of evidence for medicinal use of cannabis based products and cannabinoids. The limited number of randomised trials for unlicensed cannabis based products is partly attributable to the regulatory challenges of conducting research on drugs in Schedule 1.28 Removing these barriers is an important benefit of rescheduling, which should lead to a stronger evidence base to guide clinical decision making. At the time of writing, the UK National Institute for Health Research (NIHR) has pledged dedicated funding and has called for grant proposals to investigate cannabis based products for medicinal use. Might this medicinal product interact with other prescribed drugs? Are specific considerations necessary for young people, children and babies, older people, people with mental health problems, people with a learning disability, pregnant women, and women who are breastfeeding? If a prescription is not offered, might this patient seek or use a non-medicinal product lacking safety and quality assurance? Within this framework, specialists in the UK will need authorisation from their medical director and agreement from the multidisciplinary team, using existing protocols on controlled drugs. Therefore, use of unlicensed cannabis based products in the UK may be limited initially, even in specialist settings. Active, compassionate, and fully informed engagement with patients requesting treatment remains important, and questions to consider are given in box 2. As this is a rapidly evolving field, seek confirmation from the relevant statutory authorities before changing practice. To what extent might it be stigmatising for a patient to request and use a cannabis based product, and how can this be managed? Are patients fully aware of the difference between medicinal and non-medicinal products, their legal status, and the risk of harm or prosecution associated with them? How can I record and share information from my practice on requests for, uses of, and responses to cannabis based products to ensure that future regulations and guidance better meet the needs of patients? We used the most up to date and relevant information available to us from systematic reviews, meta-analyses, and key clinical trials. Summary statistics and grading of evidence were obtained from systematic reviews for indications included in forthcoming NICE guidelines. We referred to NICE, the Department for Health & Social Care, NHS England, the UK Home Office, and the Advisory Council for the Misuse of Drugs (ACMD). We discussed our article with clinicians, researchers, and patients. We discussed our article with patients who had health conditions for which there is evidence that cannabis based products or cannabinoids may be effective. We conducted interviews with them asking what they thought would be helpful for patients and clinicians to learn from this article. We showed them drafts of this article and invited them to provide feedback which was incorporated into subsequent versions of the article. On the basis of this feedback, we adapted the structure of the article such that recent policy developments were presented first. We expanded our discussion of the differences between medicinal products and health food supplements, and added a new table to provide an accessible overview of these different products. We highlighted that some patients may seek unlicensed or illegal products if they are unavailable on prescription, and that requesting cannabis based products from a doctor and using them could be stigmatising. TPF was funded by a senior academic fellowship from the Society for the Study of Addiction (SSA). MAPB is funded by a UCL Excellence Fellowship. MAPB, SFG, and CH are supported by the National Institute for Health Research (NIHR) University College London Hospitals Biomedical Research Centre. The views expressed here are those of the authors, and do not reflect those of the SSA, the University of Bath, UCL, or NIHR. The funders had no role on the planning, researching, or writing of this report or in the decision to submit it for publication. Contributorship statement and guarantor TPF had the idea for this article and wrote the first draft. All authors provided substantial contributions to the design of the work. CH, SFG, and MAPB wrote additional sections. Two anonymous patients suggested additional changes. All authors revised the article and approved the final version. As the guarantor, TPF affirms that the manuscript provides an honest, accurate, and transparent account of the issues covered, that there are no important omissions, and that there are no discrepancies between what was planned and the final version. All authors accept full responsibility for the work and the decision to publish. Acknowledgments We thank two patients for their feedback on previous versions of this article. Both preferred to stay anonymous. Mayor S. WHO proposes rescheduling cannabis to allow medical applications. BMJ 2019 https://www.bmj.com/content/364/bmj.l574. National Institute for Health and Care Excellence. Do Not Do Recommendations: Sativex to treat spasticity in people with MS because it is not a cost effective treatment. 2014. https://www.nice.org.uk/donotdo/do-not-offer-sativex-to-treat-spasticity-in-people-with-ms-because-it-is-not-a-cost-effective-treatment.
. The trouble with CBD oil. Med Cannabis Cannabinoids2018;1:65-72doi:10.1159/000489287. The health effects of cannabis and cannabinoids: the current state of evidence and recommendations for research. National Academies of Sciences E, Medicine. National Academies Press 2017. Highlights of prescribing information: EPIDIOLEX. 2018. https://www.accessdata.fda.gov/drugsatfda_docs/label/2018/210365lbl.pdf. emc. Nabilone 1mg capsules. 2014. https://www.medicines.org.uk/emc/product/6176/smpc. NHS England. Cannabis-based products for medicinal use. https://www.england.nhs.uk/medicines/support-for-prescribers/cannabis-based-products-for-medicinal-use/.